Here is my second pair of Burda 7447 (out of print). I love these pants. Actually, I just love pants. I now have 4 pairs of pants in my closet and I can't even begin to tell you how nice it is to be filling that hole. I've already worn my coral pair several times and each time I just keep thinking, "Gosh, I just love pants!" I know, I'm silly. Whatevs. I'm loving this pants journey quite a bit. Wanna talk shop for a minute? Alright. These pants ended up being snugger than my coral wool crepe pair. Why is that? Well, the weave of the fabric is tighter and so overall, this pair just ends up holding its shape better. I thought you might find that interesting only because these are the exact same pair and they almost look like I purposefully took them in when I didn't. Still, they're totally comfortable. If you're looking to make yourself several pairs of pants, in wool no less, and want to line them and they have a fly front, then you can not live without this book. Easy Guide to Linings is definitely one of those books that I can say without any reservation every garment sewer should have. I can't even tell you the amount of questions I get about lining garments - this book solves all those problems. You want to know different and better ways to line a garment, get this book. It's the definitive reference on the subject and it doesn't disappoint. I use it ALL the time! I added that little pocket flap to one of the pockets in the back - pretty cute right? Also, I used a cotton voile in the pockets and waistband facing. This made the pocket not peek out like they do in my coral pair. Also topstitched the pocket in place too, so that helps. There is one more thing that I need to fix on this pants pattern and from there I think I've got a perfect TNT pattern. I have at least one more pair planned for this season - one in grey - and possibly one in green. We'll see. 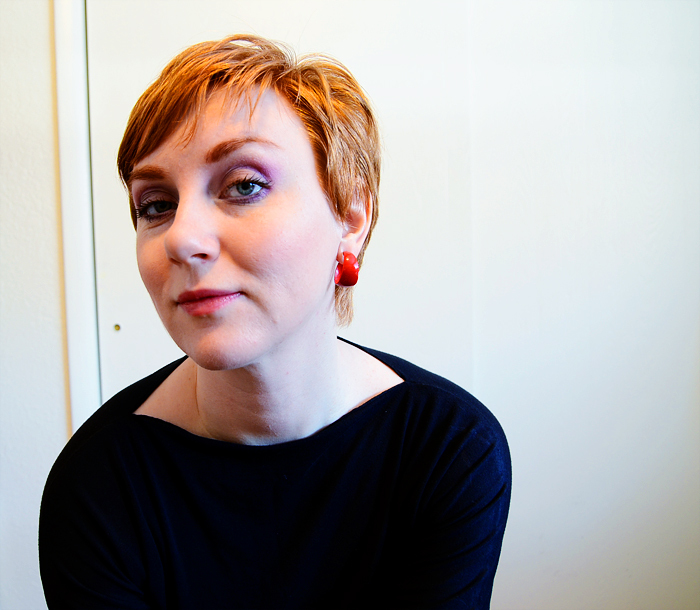 Also, just in case you were interested, this is that same top from this post - I wear this thing all the time. Its so ridiculously easy to draft and make - you guys want a tutorial? I was also thinking about putting together a resource list for everyone on where to find the best information for fitting and constructing pants. Would y'all be interested in that sort of thing? Knowing really is half the battle and sometimes its a matter of knowing where to look for info. In haircut news, I'm LOVING LOVING LOVING my new do. Thanks so much for all your of sweet comments about my hair and about my personal style journey - there were some really really wonderful comments on that front. Well, that's a wrap! 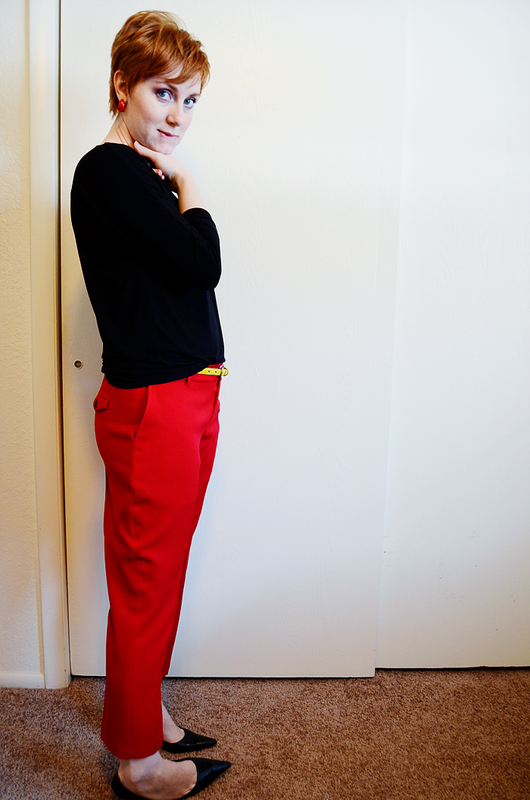 Do you lust after brightly colored pants? I did for so long and now, look! I've got 2 pairs! Yay! Hurrah for pants! I'm definitely looking forward to sewing up a bunch of them, once I get done with this whole wedding dress thing. The pants look great, and your title makes me smile because I just started reading the original Sherlock Holmes books recently and that is the exact story I'm on so far. Now I am jelous x2. I have pants envy. Also, you're a brave soul for the lining. The insides look amazing! Wow! Those pants ~ WOW! Love them! they truly look awesome. I'm going to go with your recommendation and buy the lining book - I definitely need it. Since you ask if we want a tutorial - YES PLEASE!! I reference your blog so often - if you had a book of your tutorials I would BUY it. I love the style, color and fit of these pants! I feel inspired to make a pair of colorful pants, too. Yum! Gorgeous. And they fit so well. 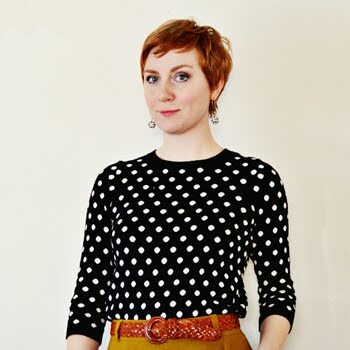 I love that top - I remember it from another post - and am waiting anxiously for the tutorial - please do! BTW - you've inspired me - I am so bored with my hair that Saturday I am having it chopped. I'm so excited! Pants look great, & your hair looks fantastic. A tutorial for that top would be great - I love the shape of the neckline - think it suits me. I tried pants last year _ Jalie jeans and Thurlows. Both are ok but I probably need to adjust them a bit but dont know how yet but maybe someday!! I followed you 1880 sewalong and love that dress, planning more for this year. I love pants too! They fit the life I actually lead. These are a fantastic fit and you obviously did a top job sewing them up properly with all the details in place and well executed. The coral colour is pretty. Those are great pants and you look stunning wearing them! Love those pants! And I would LOVE a tutorial for that top. All utterly beautiful. You are rocking your own style! Thanks for the link to the lining book, also. Great trousers, love the fit and the colour and the lining! You. Look. Amazing. Just incredibly chic. This style is so you, especially with the new 'do! Yes please to the list of pants resources! On the hair front, may I say that when I went to your referenced post and came back, my my my, you look so much cuter with short hair! Sassy! And, YES, I want a tutorial on that top. I love the neckline. These pants are pants I lust after. Is the rise moderate? Low rise "britches" just don't look good on me, and they aren't comfortable. These pants are lovely, but they are also quite striking. I think this is your best style. Simple, elegant lines with striking fabrics, or maybe that's just my style - LOL! What do you think? The color is great! And I too would be interested in a tutorial of the top and the list of pants resources :) Thanks!! The Red Hat Society ain't got nothin' on you! I don't even know where to begin with how much I love these pants!!! AH! 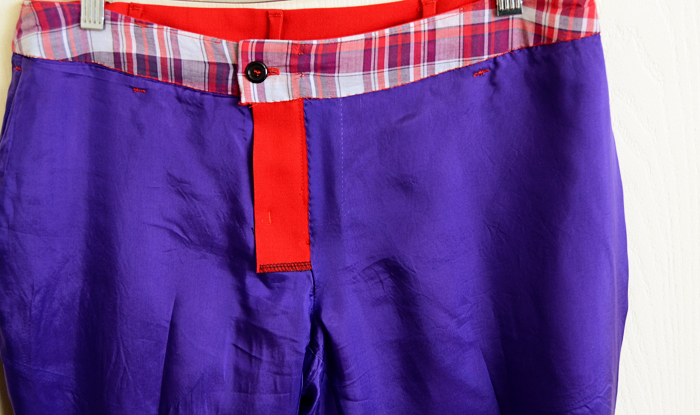 I LOVE red and purple together, and of course, blending them with the mixed plaid it just brilliant. I also can't get over the little pocket in the back! SO. FREAKIN. CUTE. You're my pantspiration lol ;) Oh, and again, you are rocking that hair cut like nobody's business! Could you get anymore awesome?! Seriously. I'm loving all these trousers on you, Sunni! I too am a pretty serious pants girl and it feels really good to throw on a nice, comfortable and sharp pair of pants to start my day. Your whole look here is so chic and sort of "boy-meets-girl-meets-Paris" kind of way! I just might pull out my red trousers today too! Although mine are not nearly as fun and punchy with that gorgeous bright lining! Purple and Red? Who knew they looked so stunning together?! Genius! Gorgeous!I love the colour. Definitely a motivator to get on the trouser-sewing this year. yes yes yes to all of your questions! Wow! These are amazing! I've never made trousers but would love to try...these are my inspiration! Oooohh!!! I love these! to be honest I love these much more than the coral pair, I think they flatter your shape more! you look tiny! I think I'll try and make pants soon, I'm trying to get back to my normal weight (I'm after a long vacation were all I did was eat) so that that I don't have to refit (and remake) the pants when I do. Thanks for the inspiration! Both your pairs of pants are lovely. I have been wanting some bright pants. I would really like more resources for pants fitting. One problem I have is that fitting without a partner is really hard. Got any tips for that? Gorgeous! 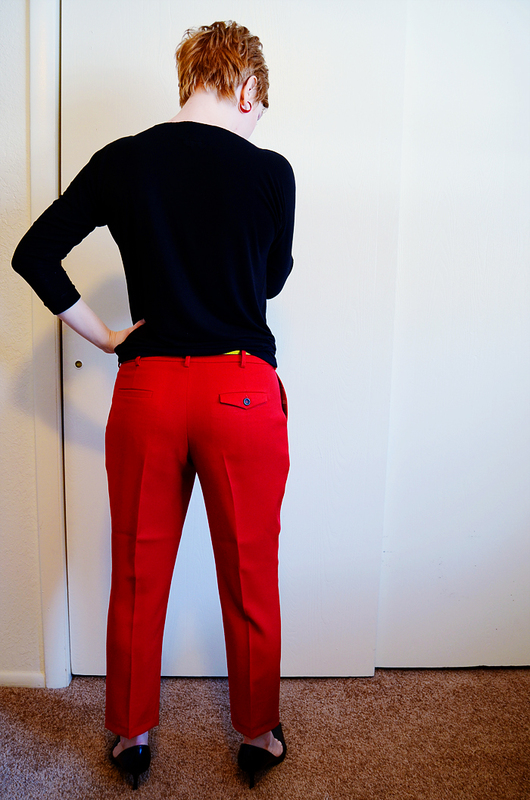 You've just reminded me that I need some red pants... I've lost weight and last year's Clovers look super super dumpy on me (wah). I'm dying over your facing/lining situation - it's totally a pants party in there, wooho! Also: POCKET FLAP. Omgggg it's so cute! LOVE them in red! What a flattering and cute style on you. I think this goes with what you were saying in the post where you were reflecting on style... sometimes what you admire and love on others doesn't always work for you. I ADORE that style of cropped fitted pant on others, but it's just uncomfortably weird on me, I feel like I'm someone else wearing them. I'm sure you know the feeling! And I'm totally going to go and order that book right this very instant. I have never tackled lining and I struggle with it in my head, as it's barely addressed in any of my sewing resources and there seems to be a lack of info online about it, unlike so many other topics. I want to conquer the lining, so thanks for the recommendation! Gosh, you look so cute! Love this outfit on you, especially with your new 'do! You're the queen of pants! I really want a pair! Love these! Well both pairs. Such a beautiful job. I'd love the pants resource list. I'm Hoping to tackle pants this year too. And I'd love a tutorial for the top! Seriously thanks for your blog. I've learned so much about sewing. I don't comment often, but thank you! adorable!!! the pants are great and I'm loving your hair. you look like Sabrina post-trip to Paris. fresh, modern, clean. love it! Those pants are fantastic, and yes I am really craving some colorful pants for spring. I am thinking turquoise. I love these pants on you. I'm so jealous as I've just spent 3 months working on this pattern and could not get an acceptable fit. (I have a very pear shaped rear) I had to give up, but still want narrow leg pants so am working on another pattern which seems to be giving a better result. I shall be stealing the pockets from this pattern though, they are really well drafted. The colour and fit of these is fabulous! I love these even more than your coral ones! As someone who has pledged to make her first pair of pants (or trousers where I come from) this year, I would definitely be interested in a resource list. I love your pants and your new hair cut! The pants are awesome, but you are totally rocking the hair cut!! I commented on your last post and told you how much I liked your pants. I also really like these, but LOVE how you styled them! Your whole look is great! First, I just got my order of tracing paper and tracing wax and I am VERY excited to try this out. I am just getting into making clothes and I think this will help immensely. Second, those pants are lovely! Very impressed. And I would love a reference/info list on pants. 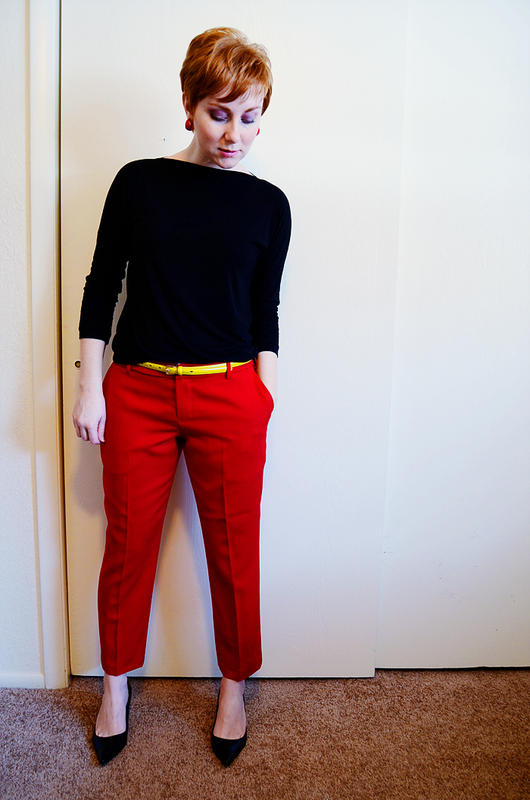 I have a hard time finding ready-made pants that fit right but haven't taken the plunge into making my own yet. I'm seriously lusting after these. The perfect pair! That haircut is absolutely alllll YOU girl!!! "I was also thinking about putting together a resource list for everyone on where to find the best information for fitting and constructing pants. Would y’all be interested in that sort of thing?" I love your pants! And a pants fitting resource list would be amazing...I'm just too scared to even think about starting to sew them at this point, which is crazy coz I wear pants ALL THE TIME! I would love anything you can offer on making pants. I just paid a great deal of money for a custom pants pattern and still have pants that don't fit. This whole look is incredible. The red pants are perfect, and you are rockin' the short locks. Thanks for the fittings book recommendation. 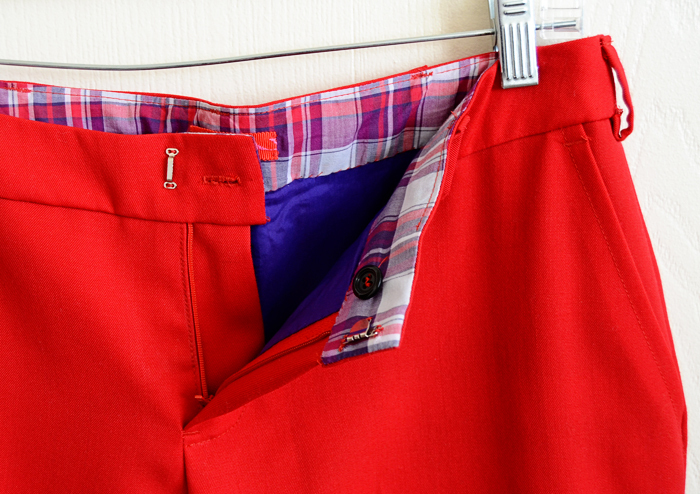 Both your red and corral pants are great. I'll go and check out the book now, sounds like a useful one to have. And a tutorial would be great, that top looks fab! Love the hair. Love the pants. Love the top! Yes, please do a tutorial on the top!! I'm about to venture into my own pant making and would love some pant resources! Also I'm not sure if you're sick of hearing it but... That hair! LOVE it! Sunni, I think that this is really YOU! the you that transpires from your posts is just like this gorgeous outfit: witty, elegant, modern, striking and I could go on and on. I am glad to see that you "found" your style. Your haircut is beautiful, it accentuates your beautiful features and just fits you :) I think we all witnessed quite a transformation and thank you for being so candid and open. And yes, I would love a tutorial for that cute top! Sunni, you look so good in the pants maybe because your hair is making you look so comfortable in your own skin! You are making me realize I need more pants in my life. And I would LOVE a tutorial on that top! Gorgeous pants. Thanks to your other pair, I have these almost completed. Thanks for the inspiration. I would LOVE a tutorial on how you made your gorgeous top. It definitely looks like something that you could make in 5 colors and just keep wearing it all week with different accessories. Thanks! You are the bomb! Ok, serious pants envy going on over here. I love these so much, too. And look at you...your first sewing post with your new 'do! It looks spectacular! Love the red, black, and punch of yellow, by the way. I am in favor of a post of pants resources. The pants look amazing! A resource list for sewing pants would be great. Just about to make my first jumpsuit.. eeepp! Your hair looks F.A.B. The pants are great. I can only dream of sewing such a professional looking pair of trousers. Would Love to have the pattern for that top. It's lovely. Luv your Cut. It really suits you! Oh...Yeah...forgot...The pant's are cute too. Love the color and the contrasting lining. Oh I love your hair cut...and I want to make those pants too. Yes please post the pant info. I have such a hard time. Thanks for sharing your journey. The pants look fantastic! Just like the last pair. And I love the pocket flap addition. It looks like your pants are winking! I would love a tutorial on drafting the knit top. I'm getting a little more into sewing knits, and am looking for some basic patterns that aren't just T-shirts. It seems kind of silly to buy a pattern that will just have to be altered for a perfect fit for a basic knit top, when you can just draft one to your measurements. Tutorial please! 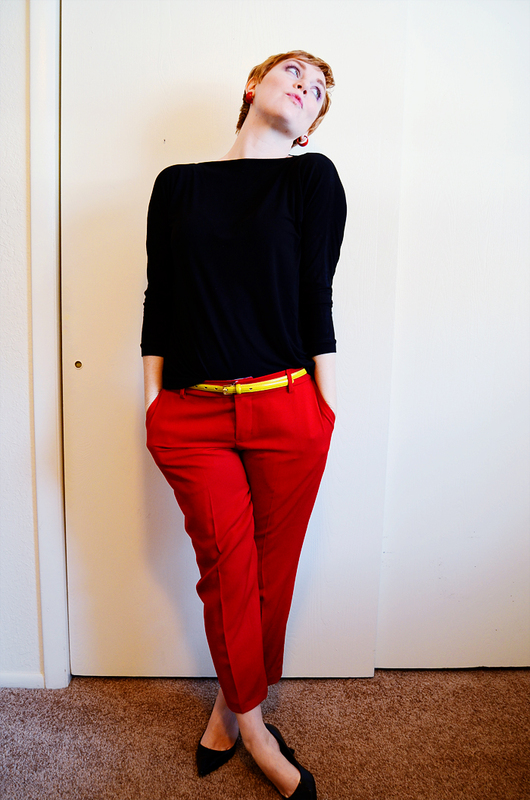 Love the trousers -particularly with the yellow belt, love your hair and would love a tutorial for the top. Great work all round! Those are AWESOME!!! JCrew's cafe capris have nothing on them. You are inspiring me to try and make pants again. My problem is when I make my fisheye dart alteration to cut out bagginess under my rear, then my pants are too tight in my hips. I am thinking the crotch may be too high. I am so impressed with your pants making abilities. Oh I love your red trousers, the little pocket looks so sweet and they suit you to a T.
I love your Hair!! I read your blog often and try to keep updated! Miss you and love you. wow, your pants look beyond fabulous. And your hair! It is so cute! I really enjoyed your post about style and changing it up. Having fine hair myself, I have come to appreciate that it dries very fast. You blog is looking good, too! I love your red pants. I love your red pixie hair too. I would love to see your tutorial for that top. It looks so versatile-easy to dress up or down. Wow!They look amazing! They make me want to try to make pants! Please, dear God, a tutorial on the pretty top! yes yes yes, please. a tutorial for that top would be lovely!